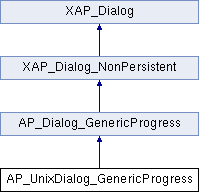 References abiDialogSetTitle(), AP_Dialog_GenericProgress::getInformation(), AP_Dialog_GenericProgress::getTitle(), m_wCancel, m_wProgress, and newDialogBuilder(). References _constructWindow(), _populateWindowData(), AP_Dialog_GenericProgress::a_CANCEL, abiDestroyWidget(), abiRunModalDialog(), AP_Dialog_GenericProgress::m_answer, m_wWindowMain, and UT_return_if_fail. Referenced by _constructWindow(), and setProgress(). Referenced by close(), and runModal().